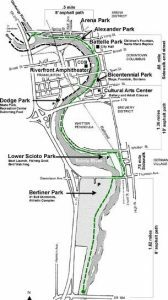 In 2005, we found that Clinton-Como Park was being cleaned by another group as well, so we began looking for a new park to clean. The Grove began cleaning up the Lower Scioto Multi-Use Trail, part of the Columbus Recreation department. The trail runs from Confluence Park down the Scioto River to Rt. 104, approximately 5 miles. 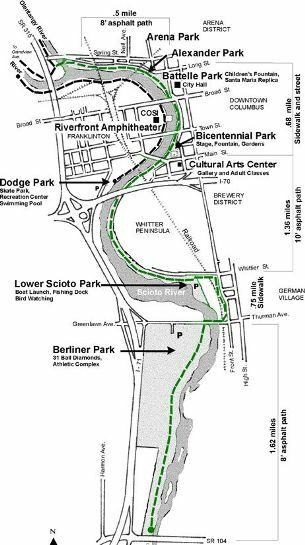 This trail covers some of the most important and visible waterfront areas in Columbus, and is a good mixture of urban and natural settings. On the map at right, the trail we had adopted is marked in green. In 2007, we ceased our adoption of this trail: the trail proved to be too long for our group to handle on a consistent basis (5 miles of trash pickup is an all-day affair), and the amount of trash in a highly urbanized area was also beyond our means to remove. While we loved the trail, we also knew that another group with more help could clean the area better than we could, and we allowed our adoption to lapse so that the next group (hopefully with more volunteers) could take on the trail and keep it clean.